As seen on Oprah Winfrey, Ellen Degeneres, Tonight Show with Jay Leno, and Pet Stars with Mario Lopez. 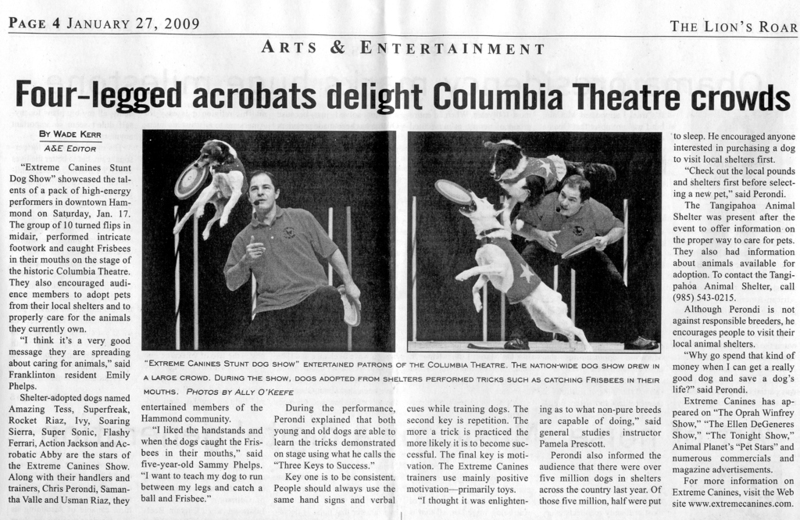 On January 17th, my “Extreme Canines Stunt Dog Show” TM was featured as a matinee and evening show for the Columbia Theatre for performing arts. I was especially honored after seeing the history behind Columbia Theatre. They have been hosting performing arts shows since 1925. It was very high class and had a wonderful atmosphere. The staff was one of the best I have ever worked in my years of performing. I’ve done over a thousand stage shows for numerous theme parks, but this was very different. I had a full staff that included me and three trainers, along with stage hands, a sound crew, and an effects team that handled the lights and spotlight. The new elements added into this one hour production were a huge hit! It was a collaborative effort between us all. The performers were: me, Lon Perondi (my dad), Samantha Valle, and Usman Riaz. We had about a dozen dogs offering new tricks and plenty of cool stunts. The show also boasted comedy antics featuring “Diggy” my human sized canine mascot! I’m proud to say we come highly recommended by Columbia Theatre. “Our theatre recently presented this fun-loving show which features a cast of talented rescue dogs who dance, fly, jump rope and wrap themselves around the hearts of the audience. Children and adults alike were amazed and moved at their feats. You and your audience will not be disappointed” said Donna Gay Anderson. Donna saw my dogs on the Oprah Winfrey show back in September of 2008. She was impressed with their talents and wanted my show for her theatre. I was flattered and honored to be asked to perform at Columbia Theater. It was a tremendous joy to be able to work with such a professional staff and be apart of their entertainment lineup for 2009. This show was also extra special to me; not only because it was my first theatre show, but because my dad was able to travel with me and assist in the production. He did an incredible job with back stage management, handling my dogs, and sending Flashy Ferrari over her record breaking jump during each performance. Samantha Valle showcased the talents of her and her “Exteme Canines”. Sam is such a talented trainer. She has been apart of the Extreme Canines Production Company since 2005. For the past three years, she has been performing as part of my second team. This was the first opportunity her and I have been able to work together personally since my ValleyFair theme park production back in 2006. Usman Riaz is my newest team member. He did a great job performing with his dog Ivy and was the one responsible for helping pull off our comedy mascot skits. Overall, this production was a huge success and I can’t wait to produce my next; which is scheduled for March 15th in Tiffon, OH! CLICK HERE FOR E-MAIL SUBSCRIPTION! What is a “Stunt Dog”? Origin of the saying "Every dog has it's day"
Is Mount Rushmore dog friendly? roses store Hope mills nc on Welcome to the Stunt Dog Experience!